Lock in a great price for Copacabana Praia Hotel – rated 8.5 by recent guests! The rooms were great and they had a balcony that I loved. The shower was absolutely amazing, the pressure was insane! Amazing!!! Loved everything: location, room, breakfast, staff. We stayed on the 9th floor. Great balcony. View of both Ipanema and Copacabana beaches. Location, location, location! 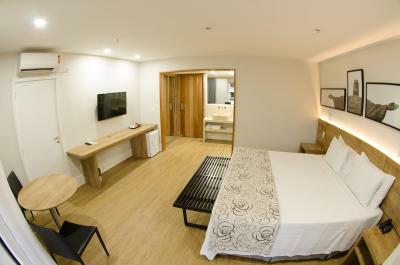 The renovated and upgraded deluxe rooms are nice, clean and spacious. Breakfast is nice. Staff is efficient and friendly. 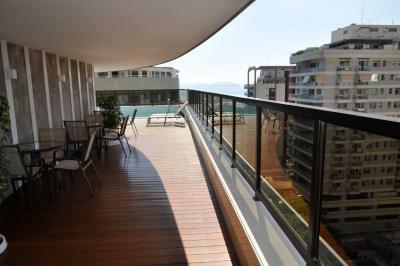 Excellent location (near to both Copacabana (2min) and Ipanema beach (5min) - just a walking distance from both !!) Staff were very very helpful and polite, they were giving us advice and answering our queries. They did an amazing job and my husband and i are very grateful to them! Very clean and tidy - bed is confortable Excellent choice if you want to enjoy Rio for few days and especially enjoy the beach side - i loved it! It was a good location close to the beach between Copacabana and Itapema. Amazing staff, really friendly and excellent service in every way! I will be back for sure! 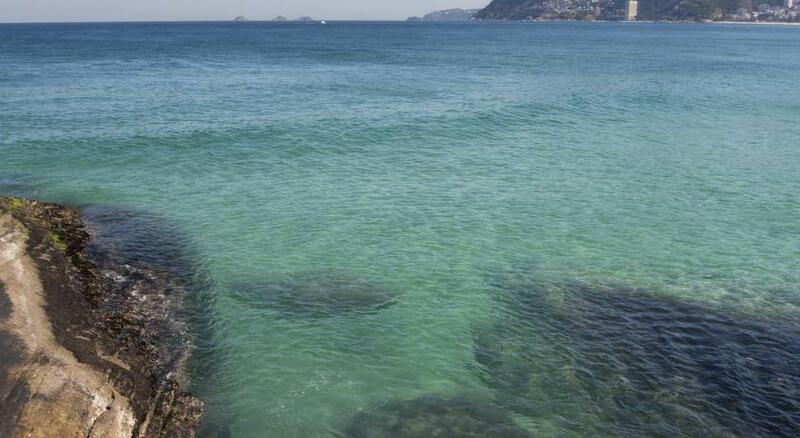 Very conveniently located, 2 minutes form Copacabana and 5 minutes from Ipanema. Safe area close to everything, including metro. The deluxe room was huge! Staff was friendly and helpful. The location was perfect, right inbetween Ipanema and Copacabana. Also a very affordable price. 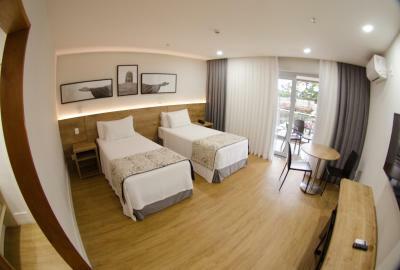 Copacabana Praia Hotel This rating is a reflection of how the property compares to the industry standard when it comes to price, facilities and services available. It's based on a self-evaluation by the property. Use this rating to help choose your stay! One of our top picks in Rio de Janeiro.The 4-star Copacabana Praia Hotel lies in an upscale area of Rio de Janeiro, only a few feet from the Copacabana Beach and a 5-minute walk from the Ipanema Beach. Each of the guestrooms is air-conditioned, has free internet access and some feature a balcony. The beautiful views are guaranteed for all guests on the terrace, where you can take the chance to relax on a lounger by the pool while savoring a cocktail. The breakfast buffet also set the Copacabana Praia apart. The restaurant provides à la carte service at lunch and dinner times. 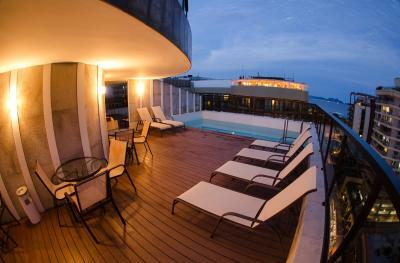 When would you like to stay at Copacabana Praia Hotel? This air-conditioned room offers a private bathroom, cable TV, telephone, safe and mini-bar. WiFi is free. This double room features air conditioning, a flat-screen TV and a mini-bar. This twin room features a mini-bar and cable TV. 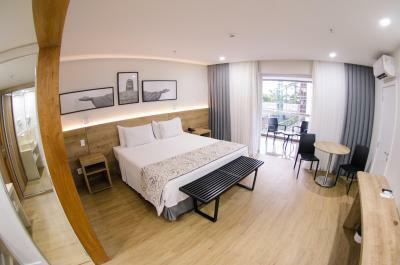 The Copacabana Beach Hotel is located at an upscale area of Rio de Janeiro, a few meters from Copacabana Beach and 2 blocks from Ipanema Beach. Services and accommodations to provide you a great experience in the city! House Rules Copacabana Praia Hotel takes special requests – add in the next step! Copacabana Praia Hotel accepts these cards and reserves the right to temporarily hold an amount prior to arrival. The elevators were broken and we had to go up to the 9th floor a few times a day... not easy when you have big suitcases or when you’ve been out and about walking all day. Also, the was was tasty,however, very limited choices and same breakfast every day. The staff was friendly and spoke good English , they recommended us nice places to eat and booked us taxies when we needed . The room was unclean. Hair strands around the bed and all over the bathroom and shower cubicle. A couple of cigarette butts on the balcony floor. Location. Walking distance from Ipanema and Copacabana beaches. The room was not as shown in the pictures and descriptions. Hotel has an old cheap part and a new moderne. Room was next to lift and you could hear the bell and the lift engine! Bathroom smell of dump as the extractor fan does not work. The cleaner should clean the head of the shower as really green !!! With small flies coming out when water waa on. Breakfast really basic. I found better fruits in the supermarket compared to the one offered. Not a 4 star breakfast for sure!!! 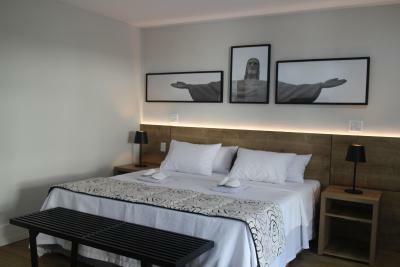 Large room and location is great just between Copacabana and Ipanema. Good value for money. Old facilities, mid-upgrade. Simple uninspiring rooms. Windows do not stop road noise. View out to building site. Bad WiFi connection in room. Average breakfast in uninspiring room. Location, proximity to both Copacabana and Ipanema. Helpful staff. The door of the bath room could not be closed. The shower itself was not really of a good standard (old, a little dirty). Some of the lights did not work. Sometimes there was no hot water. The staff was friendly. The bed was huge and comfortable. Rooms seem to only be divided by a door/thin wall and you can hear everything from the neighbouring room. The wifi never worked. specially when I needed for work. Also breakfast could improve. The room that I had was awesome! big with a balcony. The hotel’s facilities are very basic, old and a bit dirty. Our toilet got flooded and they didn’t change our room... The rooms have AC which is good, but the equipment is old and noisy. Breakfast is unimpressive. I would recommend staying somewhere else in the area, a more modern hotel. 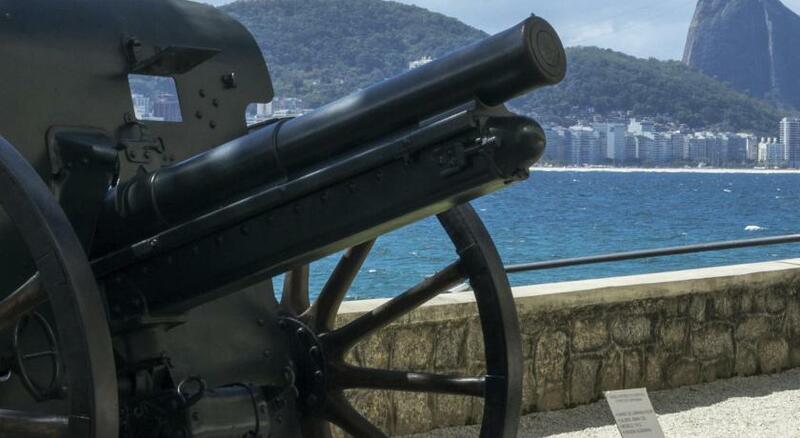 Copacabana praia hotel is just a walking distance from the famous cobacabana beach. Walking distance to praia. Spacious rooms. A safe place to stay.